Make a joyful noise unto the Lord. In Psalm 100, Solomon tells us Christians to shout with joy. Other translations say make a joyful noise or sing joyful praises, for example Bible verse: “Make a joyful noise unto the Lord” Psalm 100:1. But Solomon didn’t have to hear some of the dear saints sing in choir. And God has to be tone deaf not to cringe at some of the angelic voices. But seriously God loves each note sang to His glory. And we are to make the joyful sound all over the world. Some voices are heard on national TV every Sunday, others on the radio everyday. Still others are read daily on the smartphone or computer, for those that prefer or can’t make it to church. But most hear the Word preached every Sunday at their local churches. Bible verse in Matthew 24:14 says, “And the Good News about the Kingdom will be preached throughout the whole world, so that all nations will hear it, and then, finally, the end will come.” This means that every person shall hear the Word but not all will heed the call. A joyful noise can be a testimony, a song, a prayer, or just a kind hi there or howdy depending where you live. There are thousands of people in convalescent hospitals and homeless shelters that do not hear a kind word. And those people in hospice care homes that their families have forgotten. When you were a kid, did you have a house you were afraid to go by because the person there acted weird. I sure did, my next door neighbor lady. She was about 65 when she moved in. All the kids thought she was weird because we were so young and she didn’t have any kids. But she was always nice. I use to mower her lawn for $2.00, and she baked cookies for me. But she always saw us go to church and would ask me about the service. She couldn’t go because her daughter didn’t come to get her and she didn’t drive any more. Even a non verbal witness like when that Corvette just cut you off and took the only parking spot in the lot, did you get mad and tell them so or just said Praise the Lord any how? God deserves all the praise and honor and glory we can bestow on him. He took this worthless person and transformed us into a mouthpiece for Him. He empowered us to speak on his behalf and show the love of God by that joyful noise we make for his glory. That in it self is a miracle He did in our lives and in any person’s life that will open the door. 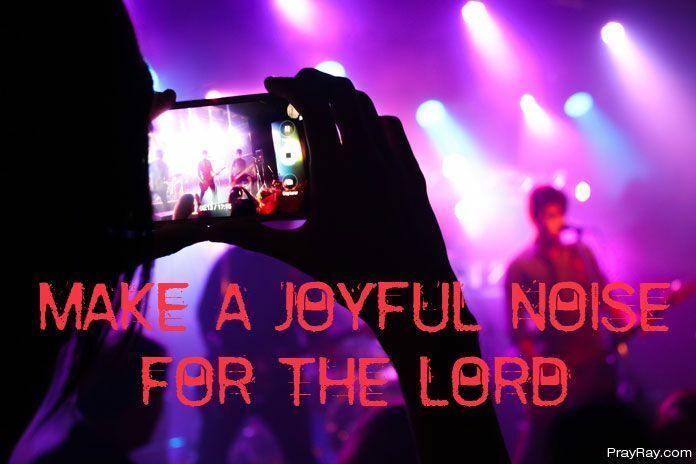 Make a joyful noise unto the Lord! Do you have something that has been passed from generation to generation? And the story that came with it might even change a little but the gist is there, me too. My mother died about 3 years ago and left me a white and blue piggy bank that has the scars of money needs over the years. This particular bank is now over 120 years old and still has a penny from when my mother got the bank from her mother and a penny from the year I was born. I wrapped this bank with all kinds of bubble wrap and carried it on the plane home. It is now locked up in my breakfront, safe until I pass it on. Bible Verse Psalm 100:5 says: “For the Lord is always good. He is always loving and kind, and his faithfulness goes on and on to each succeeding generation.” His faithfulness continues to go just like the energizer bunny to each generation. What a concept, God created us, we turn our backs on him, we come to him and he’s still there because He said He would. Bible verse Matthew 28:20 (LVB) reads, “and then teach these new disciples to obey all the commands I have given you; and be sure of this – that I am with you always, even to the end of the world.” Make a joyful noise unto the Lord and thank Him for everything He has done for us. That’s a powerful promise Jesus made just before he ascended to His Heavenly Father. I can’t carry a tune but I sing loud, I can smile, I can preach, I can type on this computer and I can just plain talk to people and help them to feel better. This is my joyful noise, what’s yours? Father we adore you and we lift up our hand to you. We can never express our love for you enough. You have given us a new life that we don’t deserve. You gave us your only Son as a sacrifice to atone for our sins and we thank you for that more than we can say. Bless those that sing and speak and visit with others. We thank you for the prayers answered and for the prayers not yet spoken for you know the needs of our Church. And Lord we pray for our leaders to listen to you first and foremost to prevent unnecessary bloodshed. Lord we pray for your will be done in these requests and remember our loved ones as they are all in need of your healing touch. Bless us all now as we make that joyful noise to the whole world. In the blessed name of Jesus Christ we ask and pray AMEN!